Our We Try Before You Buy series aims to take the stress out of shopping and eliminate the number of post office visits you make each month to return failed online orders. We test new-season buys and styling ideas so you don't have to. Here, we're letting you know what is actually worth investing in. Spring couldn't feel further away from us right now; however, just because we can't be parted from our coats for more than 10 minutes doesn't mean we can't start introducing spring pieces into our wardrobes. ASOS's new-in section is constantly being updated with 2019's key trends, from tonal beige outfits to pearl jewellery. We ordered three gigantic bags from the site to find the pieces we really think are worth investing in right now, and after hours of trying on shoes, jumpsuits, dresses and more in our fashion cupboard, we narrowed it down to 10 pieces we think are the best. This includes an orange satin wrap blouse that will have everyone asking, "Where did you get that?" and an '80s power suit that's certain to make some appearances this fashion month. Keep scrolling to see and shop the ASOS pieces we're loving right now. 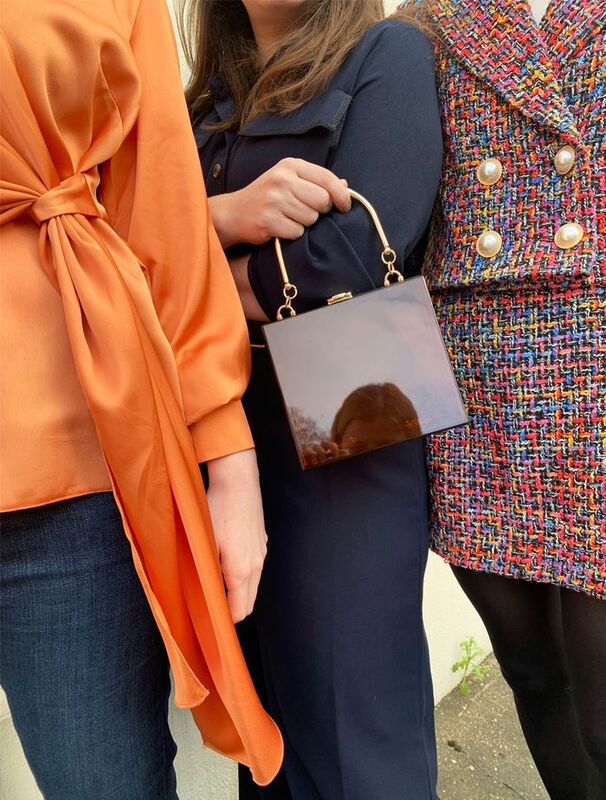 Satin has been a real success story on the high street over the past few months, thanks to slip skirts in every colour and print you could hope for. This is going to make its way into blouses this year, and I am really into this ASOS wrap-effect blouse. I have sworn off wrap tops and dresses because they can just be too precarious, however, the knot on this blouse is actually decorative so it doesn't feel like it's about to all come undone. Pearl jewellery is another key buy this season, so I paired my satin blouse with a pair of pearl drop earrings and a mini shell necklace with a pearl inside. "When trying to decide which spring/summer trend to pick, I had a moment of madness and went for the least 'me' look ever: '80s fashion. Unsurprisingly, the result—a statement skirt suit—wasn't something I would usually buy, however, there's something quite liberating about trying out new styles. Yes, it was certainly a statement piece, but I thought the dramatic silhouette and tweed-like fabric made the whole thing feel quite high-end—especially when paired with Gobstopper-sized pearl earrings and patent shoes. I would also love to try wearing the blazer with a pair of high-waisted jeans and cowboy boots for a more low-key finish," says Joy. "I mean, there's nothing subtle about this at all, so let's not even try and contextualise when and where you'd wear it. You're either a purple boilersuit kinda gal or you're not. I'd say I am, although I'd actually opt for a size or two down (this is a 12) to take out some of the volume up-top and in the legs. Also, if anyone on the design team is reading this, please add pockets! It's really a weird feeling to wear something so baggy and ultra-casual and then not be able to put your hands in your pockets. I'll forgive this time because of just how fun this all-in-one is," says Hannah. "This dress is much more in my comfort zone: simple and pared back, with just a hint of '70s styling. It might be a little chilly for it now, but come summer, this would look so good with tan accessories and maybe even a knotted silk scarf for a pop of colour. The fabric was fairly rigid, but this only helped to make the dress look more expensive—especially when paired with the belted fit and minimalist white colourway. Coming in under £50, I'll definitely be investing for my summer holidays," says Joy. "I'm in love, and I'm buying it. So flattering, so expensive-looking and so grown-up. This is a more sophisticated take on the utility jumpsuit trend, and I think it's a fantastic option for work. Add your own belt to elevate it, et voilá, you have a very trusty officewear companion that will last for some time," says Hannah. Next up, see our guide to the key trends or spring/summer 2019.